Located near Ellon in the heart of the Aberdeenshire countryside, McDonald Golf Club is a scenic 18-hole course named after its benefactor James McDonald who, in 1926, gifted the old woodlands to the people of the town. The original nine-hole course winds its way through this magnificent forest with its stately trees and beautiful rhododendron bushes, while a stream twists and turns across the course and features on almost every hole. One hole where it is particularly prevalent is the eighth, where it crosses the middle of the fairway, making club selection pivotal. The tree-lined fairways put a high premium on accuracy – none more so than on the closing two holes, which dogleg through narrow gaps. In fact, players can often be overheard in the 19th reminiscing about the wonderful score they had after 16 holes but the challenges they provide keep golfers coming back week after week. 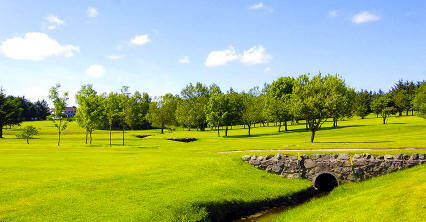 8th – The meandering stream is particularly prevalent on the eighth hole, where it crosses the middle of the fairway. It means that club selection off the tee is absolutely pivotal in order for your ball to stay dry.